Bunnies, BOGOS, and all the Peeps…..
Lots of people will be celebrating Easter, tomorrow, and lots of parents will be out, today, trying to grant their children’s wishes for their very own cuddly bunnies. Personally, I am all about pets, and bunnies are absolutely adorable. Just make sure that if you are bringing one into your home (or even more so, the home of another) that you have done your homework. Bunny rabbits will live over 10 years. They need the proper amount of space to get in ample exercise and play. If they are not given this, they will get bored and boredom ALWAYS leads to trouble. They need a lot of fiber– probably access to grass and/or hay, all day. They need to be litter trained. No two bunnies are the same. They may be affectionate, but also can be aloof and have a need for alone time. Rabbits are absolutely adorable. They are not, however, stuffed animals. If you do all your homework and still decide this is a great animal for your home, please find one you can rescue. Every Easter there are a lot of bunnies sold to people who find, soon after, they really can’t care for them and give them to a shelter. Rescuing one, which will probably already be litter trained, is a fabulous option and a win/win situation. On a totally different note (but then again, not really)….Gardein products are BOGO at Publix this week, starting Monday. This is a big celebration in my home where I stock my freezer with breakfast patties, crabless cakes, fishless fillets and chicken(less) tenders. There is such a big selection and Publix has been doing a great job of making them available to us. 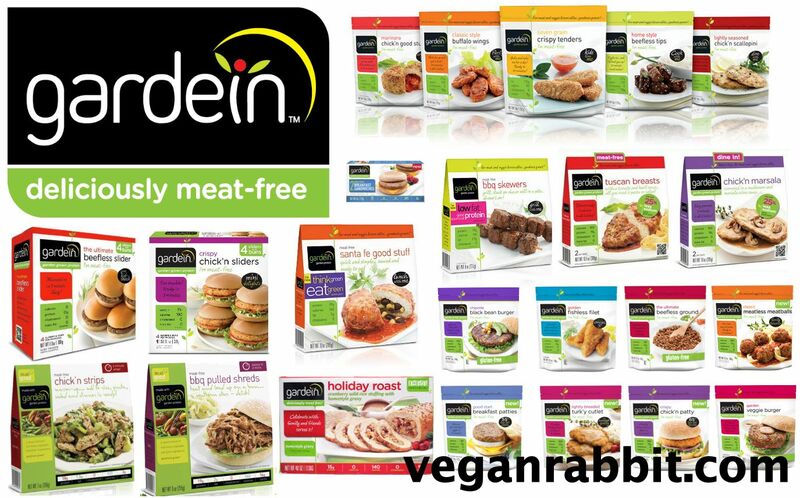 It makes me very happy to hear how many NON-vegans have added Gardein products to their shopping lists. I stay away from the ones that come with sauces, because of calories, but I bet those are REALLY good. Additionally, Earth Balance products are also BOGO @ Publix this week. It’s a good week for stocking up on some animal free products! And while I am on the topic of awesome plant-based foods, I tip my hat, once again, to the good people at the Falafel Bistro in Coral Springs/Parkland. This place consistently makes me happy. Yes, the prices can be a bit high, but seriously the food makes it all worth it. I had there food 2 days in a row this week. Not too many places in town make a vegan tofu scramble with tons of veggies, served piping hot in a cast iron skillet with all kinds of side dishes (hummus, pita, salad)…and the mushroom kabobs (which are really patties) are so good, also served with amazingly delicious sides (many to chose from)…I am pretty excited about the leftovers in the fridge! Most of their soups are vegan and enjoying a cup helps us to understand how UN-necessary creams are, when making creamy soup! Last night Mitch and I shared some creamy garlic cauliflower soup that was ABSOLUTELY AMAZING! Happy shared birthday to two women that are both so special to me, Joy and Lesley. You both add such a bright light to our world and I am so thankful to have you both in my circle. Hope you each have a wonderful day celebrating with your families…and have many, many more! Wherever you are enjoy your Saturday and your Easter weekend. I am keeping good thoughts for my family in NY this weekend, as I know it will be a tough “first.” I would like to take this opportunity to once again thank all of my friends and family for all the kind words, cards, thoughts, hugs, love and contributions made to the fund set up for my 13 year old great niece and nephew. It will certainly help their dad, who is a police officer, provide for them these next few years and is appreciated so greatly. 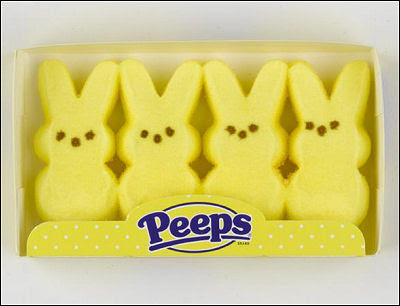 And one last thing…beware the sneaky peeps…they start in your mouth but definitely end up on your hips. They have SOOO much sugar in them, one or two should really satisfy your craving without doing any damage! Remember–it’s all about balance. And We ALL Have the Same 24 Hours…….. It was so beautiful to look at all the pictures of dogs on the internet this week…people celebrating National Dog/Puppy Day. We humans sure do love our dogs, our cats, our birds, our pet fish and turtles, etc. Basically, we are a society of self-proclaiming animal lovers. Because ALL lives matter, please consider a meatless meal or two today. Remember what’s good for the animals is also good for the earth and definitely so good for you! Happy Vegan (Feast) Thursday. Who is doing the meditation challenge? I am interested in feedback. Mitch and I are on schedule with it. The first day was ok. Yesterday, the second day, didn’t do much for me and the mantra was WAAAAAAAAAAAAY too hard to remember, making mediation more of a challenge than a time to relax. Ironically, Roxy cat is having a hard time settling in this time, too. Not sure if it’s the background music or that it just takes days of repetition. She usually LOVES meditation time and almost always ends up in a true savasana pose, but not yet this time around. All that hat said, we are happy to be back to taking the time to just SIT each morning, and today was so much better. If you haven’t joined in yet, you can still get it from the beginning. If you scroll back a few days you can find the link on here, or just google 21 day meditation challenge. Just like there is no such thing as a bad day at the beach, there are no bad meditations. I look forward to watching these 3 weeks unfold and come together. In keeping with my trying to have new experiences every day (such a hard challenge but so far so good) I held not one but 2 little babies yesterday, Sienna and Kale, each just a few months old. They were both delicious and holding them was very joyful! I am sure way back when the boys were young there were days when I held more than one, but that is a lifetime ago, so this counts as new! After the terrible tragedy in Brussels yesterday, I found it quite ironic that just by coincidence, today, I put in a cd to cool down to at the gym and hit the button and the song was What the World Needs Now–(is love sweet love) NO, not just for SOME but for EVERYONE….Certainly I feel this is very true. All my healing energy goes out to all those that are suffering physically or lost loved ones in this senseless bombing. While we all agree these extremists are incredibly dangerous and need to be stopped, I am not sure anyone short of Superman has the power. Personally, I refuse to be terrified. If I am, haven’t they won? Instead I will continue to work on living each day to it’s fullest. Hoping wherever you are, you are doing the same. Much love……. Being a HUGE fan of The Twilight Zone, I have seen all of them countless times. I hope where my brother is, he somehow knows he instilled this love, which started out as a way to terrorize his MUCH younger sister. It is said that “art imitates life and life imitates art,” and bizarre as some episodes are, I always feel this is true. Many episodes, which were all written well over 50 years ago, are as timely now as ever, some even more so. Consider the episode where the earth is continuing to get hotter each year. Was there any talk of climate change circa 1960? I particularly loved one where the news anchor woman wanting to stay young looking, bought into a water system that would reverse her aging looks…only problem was, there was no way to keep up with the rising cost of looking young and once she stopped drinking from “the fountain of youth,” the aging process sped up in overdrive. Whenever people try to sell me products that will make me look more youthful, my mind immediately goes to this episode, which is one of my favorites. Personally, I am very frightened by the amount of hate floating around in our world and our own country right now. Hatred and discrimination NEVER fix hatred and discrimination. I have NO question that Hitler felt very justified in singling out people that he hated/feared. Lots of people followed his lead, because I am sure he was quite believable…and he was, after all, a leader! People have walked around for almost 60 years wondering how this could ever happen. That answer lies in the answer above. We must be very, very careful what we wish for and who we chose to follow, or have lead us. Me, I will ALWAYS chose peace and chose to follow leaders that best reflect that choice. While I am saddened by today’s news of the attack in Brussels, this or any attack by sick extremists will NOT force me to be hateful or to discriminate against a particular race or religion. I will NOT be a gravedigger. Thanks for “listening.” Wishing YOU peace today and every day. Regular schedule at the gym tonight. See you there. Or back here. Today, we begin the 21 day meditation challenge. Looking forward to doing that shortly and starting the day off right. Then, it’s off to a full work day and a full work week. Wishing you all the beautiful possibilities that spring holds. It’s the season of rebirth, renewal and growth and everywhere we look–it is! Enjoy…. Just a reminder that the next 21-day meditation challenge begins this Monday. Hit this link and register — The theme this time is about weight loss, but my guess is it is MUCH more than just that…..
Posted on March 19, 2016 Categories Meditation2 Comments on What Will You Lose? So often people underestimate the power of a good workout. It’s pretty impossible to be sad when you are wrapped up in accomplishing a goal. When the endorphins kick in, they work like an anti-depressant to keep the mood elevated. This is why I am a huge believer, whenever possible, in morning workouts. They tend to set the mood for hours to come. Not all of us are able to find time in the morning (though for those that are dedicated, they always seem to find the time) so of course anytime is better than not at all. It’s the consistency of daily workouts that keep the mood boosted. After days and weeks of daily exercise, our moods tend to get better…and better. All of a sudden, we are craving that workout like a drug. But it’s not a drug. It may very well be addictive, but there really are few negative side effects. And on that note, I am off to lace up my sneakers and hit the streets before I head to the gym later this morning for class. What’s your mood elevation plan for today? 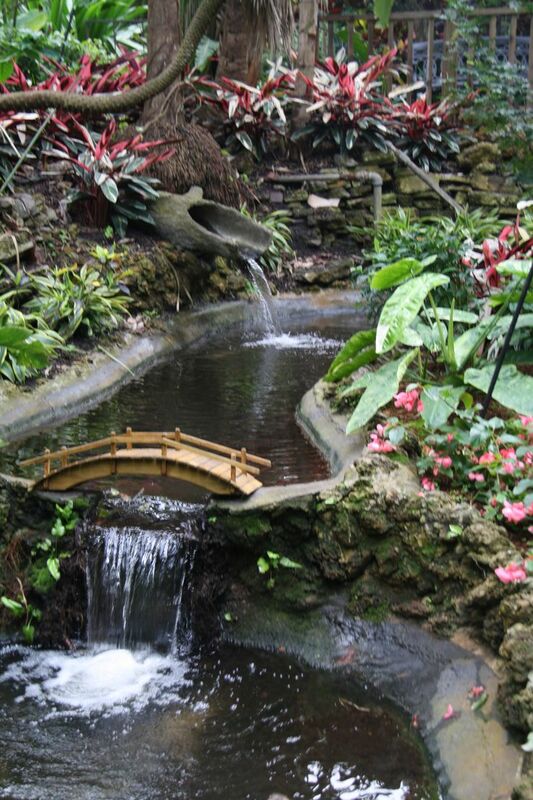 Green, Lost (but not to be found) Plants and Peace…. Happy St. Patty’s Day to one and all and may the luck of the Irish be with you as you journey through your day. 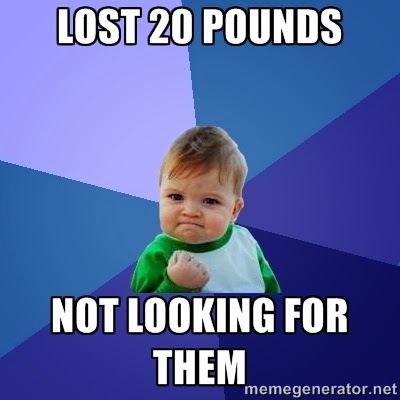 Also a HUGE congrats to Carol R. on hitting the 20 pound weight loss mark this morning. This has happened in 10 weeks, proving if you can get your brain in the right place and then make good choices one day at a time goals become accomplishments. Can’t wait to celebrate together!!! Also great article, Carole W. about the vegan course at UCSB. Knowing that someone out there is teaching our youth about veganism and how it intersects with politics, lifestyles, etc. is very encouraging! I know from my own personal experience that eating a plant-based diet has changed my thinking about almost everything! There is every reason to believe our planet would be more peaceful and compassionate if we all chose to eat living plants and not dead animals. Hence, I don’t really buy into the notion that vegans are violent. Some of the nonsense is the news is just that! Posted on March 17, 2016 Categories Holidays and celebrations, vegan thursday, weight loss1 Comment on Green, Lost (but not to be found) Plants and Peace…. Shedding the Weight: Mind, Body and Spirit! Together we’ll take steps to release the burdens that hold us back so we can start shining from the inside out. If you have never tried the meditation challenge, that would be a great place to start! I always say there is a reason that meditation and medication are only one letter apart. It’s the cure for so many things that ail us. Get out there and make it a wonderful Wednesday. Thanks for stopping in!